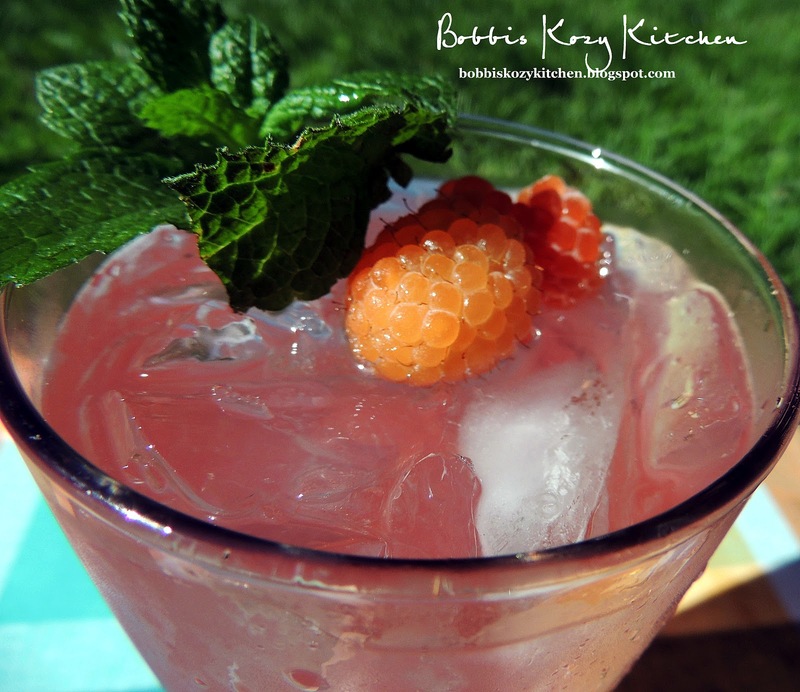 I don’t know about you but one of my favorite times of the week is Tipsy Tuesday. I love being able to share the drink my son Seth comes up with each weekend. A few times we have gotten into the drink (OK, OK, we drank too much of the drinks) and forgotten to take photo’s, but I am much better about that now. Work first, play later Bobbi! He has been wanting to try and make drinks that utilize the seasonal produce (makes a foodie Mom so proud) so he was perusing the fresh fruit when we went shopping and came across the golden raspberries. He asked me if I had ever had them. I had and told him that I really liked them. He liked the idea of using them so that it would be “different” from a regular red raspberry. As you can see though, it still gives the drink a slight pink hue. We had not made plans for the 4th. The usual plan around here was to go to a neighbors house. They usually have 100+ people there because they live in the same inlet as the yacht club for their little town. So the fireworks seem like they are just for the party goers. It really is quite spectacular. But this year we himmed and hawwed and just couldn’t seem to agree on what to do. As a foodie I just wanted to stay home and make a few things for my family. I knew that Seth and his girlfriend Heather would be here and that was enough for me. We were pleasantly surprised when Kevin’s son Dylan and his girlfriend decided to stay home as well. 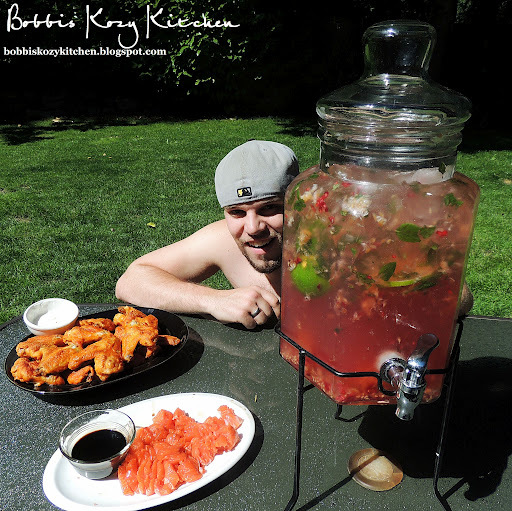 We broke out the Mojitos, some baked buffalo chicken wings, and some fresh salmon sashimi. Then the horseshoe games started. Of course the boys started betting with each other. I was just happy if I scored some points!! Dinner consisted of 2-inch thick ribeye steaks, baked potatoes from the grill, and my Mom’s creamy pea salad. It was hard to pry them away from the horseshoe pit but as soon as they saw those steaks on the grill I had their full attention! It’s amazing how that works. Once the food was ready all you heard from the guys was a noise that resembled growling. It reminded me of a dog with a bone and knew there was no way I was going anywhere near those plates until they were done with their food! Then it was back to the mojitos. Mmmm so good!! To make the simple syrup heat equal parts of sugar and water over medium-high heat. Heat just long enough for the sugar to dissolve completely but don’t let it boil. Allow to cool. Leftover simple syrup can be stored in an airtight container in the fridge. It will keep about a month. I want to thank Angie from A’lil Country Sugar for giving me this award! Check out her blog if you haven’t already. She is amazing at what she does and a wonderful person. How could you go wrong with that combination? So leave her some love from me! There are many awards that we bloggers award each other with to celebrate their achievements and hard work. I have been lucky enough to be honored with many of them. 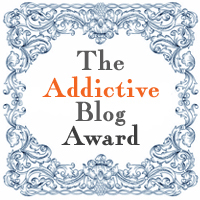 But this award strikes me as being a perfect award for a die hard blogger. We are addicted! Addicted to cooking, sharing, and seeing (or reading) the happiness our addiction brings to others. I won’t make you read my ramblings, which you all know I can do, but I will try to give the abridged version OK? I was not a foodie until I was in my late 30’s. Until then my eating habits were atrocious. Vegetables were foreign to me and I liked it that way. Cooking was something that took minimal time. I was happier if it enlisted the help of Chef Mike (the microwave) or better yet Mr Takeout! I had many a delivery service on speed dial, trust me!! But then I had a Dr tell me that I would be lucky if I would live another 10 years. You see my friends my eating habits had ballooned me up to almost 300 pounds! Yup I was on my way to being a Macy’s parade float if I didn’t do something about it. So gastric bypass it was. Scary issues arose from that but I am fine now. I told myself on to a new life, Healthy and fresh foods became my new best friends. Then in 2010 I was diagnosed with breast cancer. During my recuperation period I had nothing and mean nothing to do. Under strict Dr’s orders, I was not allowed to lift, push, pull, cook, clean, or drive. FUN!! That was when I remembered my kids trying to talk me into starting a food blog to share my new passion with whoever might want to read me. I figured that would be maybe family members and friends, but what the heck? Typing was one thing I was allowed to do. So away my fingers flew, and here I am today. A little over a year ago I started posting once in a while and now I can’t stop! I also can’t see me doing anything else. I love it!! Ok, now on to the good stuff, I get to share some of my favorite bloggers with you! Yay!! Listing only 10 is hard for me because I know so many awesome bloggers. But here are just a few. Now, enough of me, go check these wonderful blog out! I know you will find them as addictive as I do! !